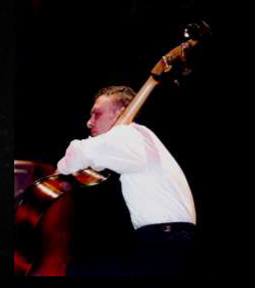 Jazz bassist and latin/classical guitarist. Kamil Erdem made his career mainly through his works and performances inspired by the scales and rhythms of the music of the Balkans, Anatolia and the Middle East. However, mainstream jazz has also been one of his primary interests, both as a player and teacher. Erdem founded the group Asiaminor in 1990, which has given him access to the international music scene for more than 10 years. As the leader of the band he toured several times in Europe (1990-2002) and the USA (1996,1998,2003) and released three albums, Along the Street (1991), Longa Nova (1996), and Cat's Dream (1997). Kamil's versatility as a musician brought him to many international projects to play together with musicians from all over the world, coming from different musical genres. He released two albums reflecting his collaboration with European musicians, "Kamil Erdem Quartet - Odd Tango" (2008) and "Kamil Erdem - René Sopa Quartet" (2010). Through his international career as a performer, Kamil Erdem played concerts in Germany, Austria, Switzerland, Holland, Italy, Spain, Greece, Sweden, Bulgaria, Bosnia Herzegovina, Czech Republic, Slovakia, Poland, the United States, Egypt and South Africa. Kamil Erdem has an international career as a teacher and clinician and has been conducting master classes, workshops and seminars at prestigious institutions in various countries. Between 2001 and 2016 he has been a faculty member at Yıldız Technical University, Department of Music and Performing Arts.